The examples are taken from real VoLTE networks (test UE). The IP, FQDNs, IDs, URIs etc. were modified. It indicates what is the domain user is registering to. This will be used an input for DNS NAPTR/SRV query. 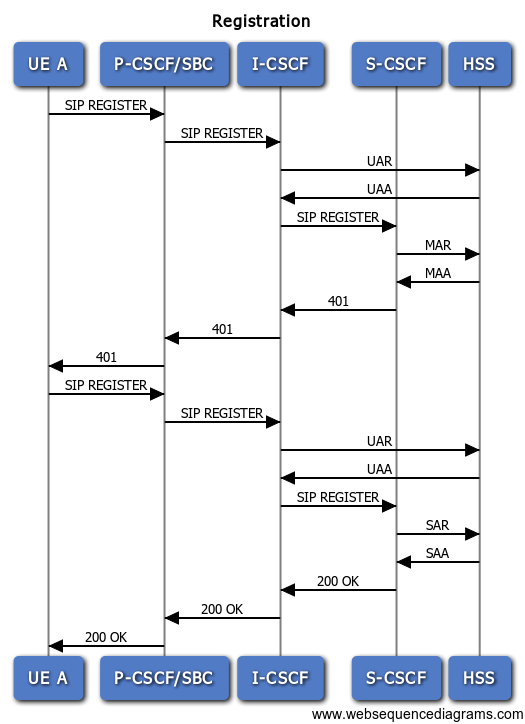 Note that these days probably all operators use an MSISDN or IMSI as a part of the sip uri. As we mentioned in previous post the sip.instance is used to identify a particular client instance. Last but not least we can find the famous PANI header which contains the information about the access network and also the information about location which can be used for example in case of an emergency call. The Authorization header contains the Username and Realm, but as the Response field is empty we know that the S-CSCF will challenge the UE to prove its identity first. SBC can add also an information related to charging. The P-CSCF requires the path header as this field is used to forward its address to S-CSCF. S-CSCF then knows for each user what SBC is maintaining the dialog with UE. Finally it adds its own address in the Via header for the routing of the response message. The main purpose of the UAR is to get the address of s-cscf for the given IMPU in the UAA. Each user has an assigned S-CSCF. The server name and capabilities can be missing. In that case a default decision can be taken by I-CSCF. Server-Name – Stored S-CSCF name in the user profile. If it is not available, Server-Capabilities will be used. as I-CSCF and S-CSCF are often collocated in the same box (CSCF/IMSCore) don’t be confused if this message is missing. Anyway except the Via header there is no new information there. Via MAR the S-CSCF asks for the authentication vectors. Based on this data the S-CSCF will challenge the UE. Nonce is a one-time generated value which ensures that the response can be used only once. So even in case that someone would intercept the response he will get a key which can be used only once (nonce=base64(RAND, AUTN, server specific data)). Note that the P-Charging-Vector is missing. That’s because SBC protects the IMS network and its responsibility is not to reveal any private data to untrusted network. This is the second REGISTER message that we can learn from the CSeq header. It doesn’t necessarily have to contain ‘2’ but the value from the previous REGISTER has to be incremented. The key information here is the Response. This is the value which the S-CSCF will compare with the data retrieved HSS. If the Response is matching the user is successfully registered. The S-CSCF receives in the Path header the information about what P-CSCF and what ATCF (in case of eSRVCC) are anchoring the user. This information is valid for the whole duration of registration. In the Service-Route header the S-CSCF informs the SBC about its own address. From now on we don’t need to go through the I-CSCF anymore. In the P-Associated-URI header the S-CSCF send the user’s identity which is then later inserted by SBC into subsequent messages (e.g. SIP INVITE, SIP MESSAGE) as P-Asserted-Identity. Public-Identity – IMPU, note that there can be more IMPUs associated with the subscriber. This particular IMPU will be used for this registration (e.g. each IMPU can use a different service profile). How to read IFCs is described in its own post. I’m quite sure that we were too brief today. On the other hand this is not a spec and the post can be already a bit difficult to read. Let me know if there is any header which deserves more attention. This entry was posted in IMS and tagged cap, ims, pcap, Registration, registration trace, SIP, VoLTE, volte trace, wireshark. Bookmark the permalink. What is IMPI and IMPU? IMPU means mobile number and impI means mobile number + mnc+mcc + domain name. So how one IMPI can have multiple IMPU. How one IMPI can have a multiple IMPU in Volte. Can you please take example of IMPI and IMPU. Thanks in advance. In case of the first request we don’t know what S-CSCF to use (unless the subscriber is already registered using some other device). With the second message we have to make sure, that the same S-CSCF is used (as it handles the authentication).